EV3 Three Wheel Electric Mobility Scooter 800 Watt Motor 48V - 18 MPH - 30 Range. The EV3 800 Watt Mobility scooter also known as MJ-06 is a 3 wheel high-power mobility scooter using a transaxle brushless electric motor. The EV3 Mobility scooter has 4 large batteries (12 Volt, 20 amps each)and an All-In-1 rear end differential motor just like the ones found in high priced mobility scooters. At full battery power the EV3 can get up to 15 mph which easily makes it the fastest mobility scooter on the market! 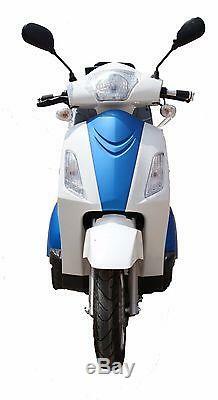 For riders safety it comes with, Brake System with Power Cut-off. Also included: Reverse gear, armrest and stylish cargo basket. The EV3 800 watt Mobility scooter comes equipped with two rear shock absorbers on the frame. The E-ABS brake assistant system, with park brake and reverse switch provides the safety standards that you can rely on. The EV3 is classified as a power chair or mobility scooter even though it can cruise at speeds over 18+ MPH and is legal everywhere as allowed by state regulations. You don't need to be handicapped or old to ride this electric scooter because the EV3 Mobility scooter is a great scooter for both fun and transportation. Please note that this mobility scooter takes off quick, and it will easily ride a wheelie if the throttle is turned up to maximum. This item ships by a truck to your Door. The items that the customer is required to attach on the scooter are front wheel, basket and wheelie bar. EV3 800 Watts Electric Mobility Scooter Key Features. 800 Watt Transaxle differential High Torque Motor. 18 MPH top speed and Up to 30 Miles range per charge. 48Volt 20Ah high performance battery that delivers strong current and longer range. FREE - 48 Volt Light Weight Smart charger. Storage, Rear Basket and Glove Box. Max Speed Knob & Variable speed throttle to adjust speed. Brake System with Power Cut-off, for safe riding. CLASSIFICATION: Battery Powered Electric Motor, 3 Wheel Street legal Mobility Scooter. MOTOR TYPE: 800 Watt Transaxle differential High Torque Motor. BATTERY POWER: 48 Volts(4 x 12V), 20 Amp Sealed Lead Acid Batteries, 59 lbs battery. TIRE SIZE: 16" x 2.5" Front & Rear on 16 Deluxe Alloy Rims, with two small rear wheels for safety. CHARGER: 50V / 1.8A Smart charger included Free. SPEED: Up to 18 MPH among the Fastest Mobility Scooters. DRIVE RANGE/Charge: Up to 30 miles per charge. CLIMBING CAPACITY: 12 Degree incline. THROTTLE TYPE: Variable speed control- Twist Throttle. CONTROLLER: Digital - Sealed & Weather proof. BRAKING SYSTEM: E-ABS brake system, with park brake, with reverse switch. DRIVE SYSTEM: Brushless Motor - rear axle with differential unit. DIMENSIONS: 65"L x 27"W x 43H inches. SEAT TYPE: Large Cushioned Executive Captain Seat. NET WEIGHT: 195 Lbs W/Batteries. SUSPENSION: Hydraulic Shocks- Two rear shock absorbers on the frame. 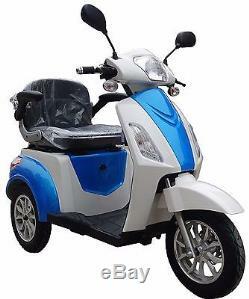 The item "EV3 Electric Luxury 3 Wheel Travel Power Scooter 15 MPH 30 Mile Range" is in sale since Sunday, May 17, 2015. This item is in the category "Health & Beauty\Medical & Mobility\Mobility/Walking Equipment\Mobility Scooters".